John Owen said of John Bunyan, a powerful preacher and the best-known of all the Puritan writers, that he would gladly exchange all his learning for Bunyan’s power of touching men’s hearts. John Bunyan was born in 1628 at Elstow, near Bedford, to Thomas Bunyan and Margaret Bentley. Thomas Bunyan, a brazier or tinker, was poor but not destitute. Still, for the most part, John Bunyan was not educated well. He became rebellious, frequently indulging in cursing. He later wrote, “It was my delight to be taken captive by the devil at his will: being filled with all unrighteousness; that from a child I had but few equals, both for cursing, swearing, lying, and blaspheming the holy name of God” (Works of Bunyan, ed. George Offor, 1:6). Sporadic periods of convictions of sin helped restrain some of that rebellion, however. When Bunyan was sixteen years old, his mother and sister died a month apart. His father remarried a month later. Young Bunyan joined Cromwell’s New Model Army, where he continued his rebellious ways. Fighting in the Civil War sobered him considerably, however. On one occasion, his life was wonderfully spared. “When I was a soldier, I with others, was drawn out to go to such a place to besiege it. But when I was just ready to go, one of the company desired to go in my room; to which when I consented, he took my place, and coming to the siege, as he stood sentinel he was shot in the head with a musket bullet and died” (ibid.). Bunyan was discharged from the army in 1646 or 1647. His military experience was later reflected in his book, The Holy War. In 1648, Bunyan married a God-fearing woman whose name remains unknown, and whose only dowry was two books: Arthur Dent’s The Plain Man’s Pathway to Heaven and Lewis Bayly’s The Practice of Piety. When Bunyan read those books, he was convicted of sin. He started attending the parish church, stopped swearing (when rebuked by a dissolute woman of the town), and tried to honor the Sabbath. After some months, Bunyan came into contact with some women whose joyous conversation about the new birth and Christ deeply impressed him. He mourned his joyless existence as he realized that he was lost and outside of Christ. “I cannot now express with what longings and breakings in my soul I cried to Christ to call me,” he wrote. He felt that he had the worst heart in all of England. He confessed to be jealous of animals because they did not have a soul to account for before God. One day, as I was passing in the field, this sentence fell upon my soul: Thy righteousness is in heaven; and methought withal I saw with the eyes of my soul, Jesus Christ, at God’s right hand; there, I say, as my righteousness; so that wherever I was, or whatever I was a-doing, God could not say of me, He wants my righteousness, for that was just before Him. I also saw, moreover, that it was not my good frame of heart that made my righteousness better, nor yet my bad frame that made my righteousness worse; for my righteousness was Jesus Christ Himself, the same yesterday, today, and forever. Now did my chains fall off my legs indeed. I was loosed from my afflictions and irons; my temptations also fled away. Now I went home rejoicing for the grace and love of God. I lived for some time very sweetly at peace with God through Christ. Oh! methought, Christ! Christ! There was nothing but Christ that was before my eyes. I saw now not only looking upon this and the other benefits of Christ apart, as of His blood, burial, and resurrection, but considered Him as a whole Christ! It was glorious to me to see His exaltation, and the worth and prevalency of all His benefits, and that because now I could look from myself to Him, and would reckon that all those graces of God that now were green in me, were yet but like those cracked groats and fourpence-halfpennies that rich men carry in their purses, when their gold is in their trunk at home! Oh, I saw that my gold was in my trunk at home! In Christ my Lord and Saviour! Now Christ was all (Grace Abounding, paragraphs 229-32, pp. 129-31). The year 1654 was a momentous one for Bunyan. He moved to Bedford with his wife and four children under the age of six; his firstborn, Mary, was blind from birth. That same year, he became a member of Gifford’s church, and was soon appointed deacon. His testimony became the talk of the town. Several people were led to conversion in response to it. By the end of the year, he had lost his beloved pastor to death. In 1655, Bunyan began preaching to various congregations in Bedford. Hundreds came to hear him. He published his first book the following year, Some Gospel Truths Opened, written to protect believers from being misled by Quaker and Ranter teachings about Christ’s person and work. Two years later, Bunyan published A Few Sighs from Hell, an exposition of Luke 16:19-31 about the rich man and Lazarus. The book attacks professional clergy and the wealthy who promote carnality. It was well received, and helped establish Bunyan as a reputable Puritan writer. About that same time, his wife passed away. In 1659, Bunyan published The Doctrine of the Law and Grace Unfolded, which expounds his view of covenant theology, stressing the promissory nature of the covenant of grace and the dichotomy between law and grace. This helped establish him as a thoroughgoing Calvinist, though it led to false charges of antinomianism by Richard Baxter. In 1660, while preaching in a farmhouse at Lower Samsell, Bunyan was arrested on the charge of preaching without official rights from the king. When told that he would be freed if he no longer preached, he replied, “If I am freed today, I will preach tomorrow.” He was thrown into prison, where he wrote prolifically and made shoelaces to provide some income for twelve and a half years (1660-1672). Prior to his arrest, Bunyan had remarried, this time to a godly young woman named Elizabeth. She pleaded repeatedly for his release, but judges such as Sir Matthew Hale and Thomas Twisden rejected her plea. So Bunyan remained in prison with no formal charge and no legal sentence, in defiance of the habeas corpus provisions of the Magna Carta, because he refused to give up preaching the gospel and denounced the Church of England as false (see Bunyan’s A Relation of My Imprisonment, published posthumously in 1765). Prison years, however, were productive years for Bunyan. In the mid-1660s, Bunyan wrote extensively, with only the Bible and Foxe’s Book of Martyrs at his side. In 1663, he wrote Christian Behaviour, intended as a handbook for Christian living and a response against charges of antinomianism, as well as a last testament, since Bunyan expected to die in prison. He also finished I Will Pray with the Spirit, which expounded 1 Corinthians 14:15, and focused on the Spirit’s inner work in all true prayer. In 1664, he published Profitable Meditations; in 1665, One Thing Needful, The Holy City (his understanding of church history and the end times), and The Resurrection of the Dead. This latter work is a sequel to The Holy City, in which Bunyan expounds the resurrection from Acts 24:14-15 in a traditional way, and then uses his prison torments to illustrate the horrors that await the damned following the final judgment. In 1666, the middle of his prison-time, he wrote Grace Abounding to the Chief of Sinners, in which he declared, “The Almighty God being my help and shield, I am determined yet to suffer, if frail life might continue so long, even till the moss shall grow upon my eyebrows, rather than violate my faith and principles.” During the last part of his imprisonment, he finished A Confession of My Faith, A Reason for My Practice, and A Defence of the Doctrine of Justification, an uncompromising criticism of the rising tide of Pelagianism among the Nonconformists and latitudinarianism among the Anglican establishment. The Bedford congregation, sensing some relaxation of the law against preaching, appointed Bunyan as pastor on January 21, 1672, but Bunyan was not released until May. He had been the first to suffer under Charles II and was the last to be released. His long years in Bedford’s county prison made him a martyr in the eyes of many. Bunyan had enjoyed only a few years of freedom when he was again arrested for preaching and put in the town jail. Here he wrote Instruction for the Ignorant (a catechism for the saved and unsaved that emphasizes the need for self-denial), Saved by Grace (an exposition of Ephesians 2:5 that encourages the godly to persevere in the faith notwithstanding persecution), The Strait Gate (an exposition of Luke 13:24 that seeks to awaken sinners to the gospel message), Light for Them That Sit in Darkness (a polemical work against those who oppose atonement by Christ’s satisfaction and justification by His imputed righteousness, especially the Quakers and Latitudinarians), and the first part of his famous Pilgrim’s Progress. That book, which sold more than 100,000 copies in its first decade in print, has since been reprinted in at least 1,500 editions and translated into more than two hundred languages, with Dutch, French, and Welsh editions appearing in Bunyan’s lifetime. Some scholars have asserted that, with the exception of the Bible and perhaps Thomas à Kempis’s The Imitation of Christ, this Bunyan classic has sold more copies than any other book ever written. John Owen, minister of an Independent congregation at Leadenhall Street, London, successfully appealed for Bunyan to Thomas Barlow, bishop of Lincoln, who used his influence at court to secure Bunyan’s release from prison on June 21, 1677. Bunyan spent his last years ministering to the Nonconformists and writing. In 1678, he published Come and Welcome to Jesus Christ, a popular exposition of John 6:37 that movingly proclaims a strong free offer of grace to sinners to fly to Jesus Christ and be saved. This book went through six editions in the last decade of Bunyan’s life. In 1680, he wrote The Life and Death of Mr. Badman, described as “a series of snapshots depicting the commonplace attitudes and practices against which Bunyan regularly preached” (Oxford DNB, 8:707). Two years later, he published The Greatness of the Soul and The Holy War. In 1685, he published the second part of Pilgrim’s Progress, dealing with Christiana’s pilgrimage, A Caution to Stir Up to Watch Against Sin, and Questions About the Nature and the Perpetuity of the Seventh-day Sabbath. In the last three years of his life, Bunyan wrote ten more books, of which the best-known are The Pharisee and the Publican, The Jerusalem Sinner Saved, The Work of Jesus Christ as an Advocate, The Water of Life, Solomon’s Temple Spiritualized, and The Acceptable Sacrifice. Most of those books were reproduced in paperback by William Frasher in the 1960s through Reiner Press, in Swengel, Pennsylvania. They are not listed separately in this book because they are included in Bunyan’s Works. In 1688, Bunyan died suddenly from a fever that he caught while traveling in cold weather. On his deathbed, he said to those who gathered around him, “Weep not for me, but for yourselves. I go to the Father of our Lord Jesus Christ, who will, no doubt, through the mediation of his blessed Son, receive me, though a sinner; where I hope we ere long shall meet, to sing the new song, and remain everlastingly happy, world without end” (Works of Bunyan, 1:lxxviii). After telling his friends that his greatest desire was to be with Christ, he raised his hands to heaven, and cried, “Take me, for I come to Thee!” and then died. He was buried in Bunhill Fields, close to Thomas Goodwin and John Owen. The Works of John Bunyan (BTT; 3 vols., 2,400 pages; 1999). Bunyan was unusual among the Puritans in that he had little formal education. Nevertheless, he read exhaustively, and the Holy Spirit blessed his studies. He became a prolific writer and wrote more than sixty works in sixty years. Many of those have been overshadowed by Pilgrim’s Progress and The Holy War, but they are still worthy of reading. Bunyan’s works are a treasure of scriptural, experiential truth. He was a Spirit taught theologian who had the gift of interpreting evangelical truth for the masses. Bunyan was one of the most popular Puritans, no doubt because, while possessing the Word-centeredness and depth of doctrine and experience of other Puritans, he presented truth with warm simplicity. 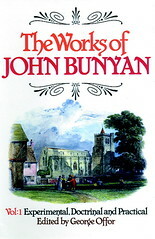 Several publishers have reprinted Bunyan’s individual works. Most recently, SDG has reprinted The Fear of God, in which Bunyan addresses the objects and reasons for fearing God, the various kinds of fear, the character and effects of godly fear, and the privileges and uses of this doctrine. BTT has also reprinted five of Bunyan’s works (The Acceptable Sacrifice, All Loves Excelling, Come and Welcome to Jesus Christ, The Jerusalem Sinner Saved, and Prayer) in the Puritan Paperback Series. GM has reprinted Groans of a Lost Soul, Solomon’s Temple Spiritualized, and Advice to Sufferers, among others. For those wishing to own the best of what Bunyan has written, the BTT edition of George Offor’s 1854 compilation is the best option. It offers fifty-five of Bunyan’s works in three volumes. The first volume contains valuable introductions and an eighty-page memoir of Bunyan’s life and times. Volumes 1 and 2 contain his experimental, doctrinal, and practical works, such as Christ a Complete Saviour and The Fear of God. Volume 3 has Bunyan’s allegorical, figurative, and symbolical works, such as The Pilgrim’s Progress, The Holy War, and The Life and Death of Mr. Badman, as well as a compendious index. Christiana’s Journey; Or, The Pilgrim’s Progress, The Second Part (BP; 150 pages; 1993). This edition contains the text of Christiana’s Journey and seventy-three beautiful full-page oil paintings by Albert Wessels, which especially engage children. Bunyan may have been motivated to write the second part of Pilgrim’s Progress in which Christiana and other female characters, as well as children, play prominent roles to depict a more subdued way in which the Holy Spirit often works conversion in typical church members. Hence Christiana and her children do not fall into the Slough of Despond nor have such a dramatic experience at the cross as Christian did. Christian and Christiana traverse much of the same ground, which shows the universality of believers’ spiritual experiences, but the section on Christian is more autobiographical while the section on Christiana is more corporate and normative, showing a more typical morphology of conversion. Grace Abounding to the Chief of Sinners (AP; 243 pages; n.d.). An indispensable source for Bunyan’s early life and conversion, this autobiographical classic chronicles his life from infancy to his imprisonment in 1660. Text on the remainder of Bunyan’s life is supplied by the editor. It provides an open and candid look into his life struggles, showing that God’s grace abounds to even the chief of sinners. 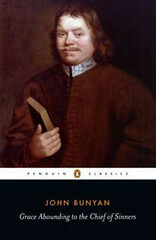 Richard Greaves writes, “Although conventional in structure, Grace Abounding transcends contemporary examples of the genre in its depth of psychological experience, its riveting account of Bunyan’s struggle to keep from succumbing to pervasive, numbing despair, and his agonizing wrestling with biblical texts” (Oxford DNB, 8:705). Grace Abounding was published six times during Bunyan’s lifetime, and has been reprinted scores of times over the centuries. This reprint is taken from the eighth edition. 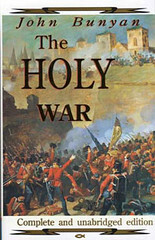 The Holy War (Reiner; 454 pages; 1974). This allegory, second only to Pilgrim’s Progress, bears the full title of The Holy War, made by King Shaddai upon Diabolus, for the Regaining of the Metropolis of the World; or, the Losing and Taking again of The Town of Mansoul. Reiner’s edition contains the valuable “explanatory, experimental, and practical notes” of George Burder and sixty-eight engravings. Macauley claims that The Holy War, written after Bunyan’s imprisonment, “would be the best allegory ever written if Pilgrim’s Progress did not exist.” The Holy War is more difficult to read but is also more profound in places than Pilgrim’s Progress partly because it involves several levels of allegory. “Mansoul is not only the soul of each believer and the allegorical personification of Christianity but the symbol of England itself” (Oxford DNB, 8:707). The Holy War contains valuable counsel on how to fight the good fight of faith. It will richly reward the meditative reader. 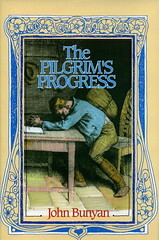 The Pilgrim’s Progress (Reiner, 1974; BTT, 1983; BP, 1999). This is a moving, allegorical account of spiritual warfare experienced by a wayfaring pilgrim traveling from the City of Destruction to the Celestial City, in which Bunyan allegorizes his own religious experience as a guide for others. “Christian is both pilgrim and warrior, and the message of The Pilgrim’s Progress is not only a call to embrace and persist in the Christian life, but also a summons to battle the forces of evil” (Oxford DNB, 8:705). Bunyan’s insights into mankind’s desperate plight and God’s redeeming grace make this a legendary classic. Regeneration, faith, repentance, justification, mortification, sanctification, and perseverance are poignantly painted for us in biblical, doctrinal, experiential, and practical detail. Among the more than two dozen reprints of Bunyan’s classic since 1960, three are worthy of mention. First, an excellent edition of both parts of Pilgrim’s Progress containing the invaluable explanatory notes of Thomas Scott, original marginal notes, and textual support, has been reprinted by Reiner (1974), and is the most helpful edition. It includes a helpful 50-page memoir of Bunyan by Josiah Condor. Second, Banner of Truth Trust published a deluxe edition in 1983, which includes original marginal notes and references from Scripture, both parts of Pilgrim’s Progress, and a series of sketches by William Strang. Third, Bunyan Press has issued a handsome, coffee-table volume containing the complete text of Pilgrim’s Progress along with a beautiful collection of more than seventy oil paintings by Albert Wessels. This edition is excellent for helping children grasp the classic story. A number of retellings of Bunyan’s famous story have been printed for children by other publishers.